Who would want to revive the 1970s? | Compare odds UK, Europe, Premier League and European leagues. You are here: Home › Previews › Reviews › Who would want to revive the 1970s? Who would want to revive the 1970s? Jeremy Corbyn, has been well known during his long political career to have rejected wearing a tie. Only since he landed the job of leading the Labour party has he started wearing one. Tellingly he also wears corduroy, not because he wants to look like a school teacher or that he, like corduroy, is durable yet soft, but as a subtle indication as to his political leanings. Fashion styles can be used as a leading indicator for stock markets and the economy (an indicator of what the future holds). It just so happens that corduroy is making a come back. 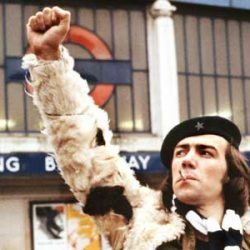 Among a diverse and long history spanning hundreds of years corduroy was a symbol of the anti-establishment movement in the 1960s and 1970s. Historians who support and defend the 1970’s defend the quirky fashions and time when recorded music was central to cultural changes. Radical politicians are back in fashion and the odds have increased that what seems like radical political ideas will cause the UK to repeat history. 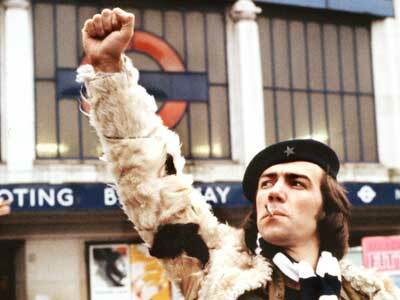 Citizen Smith (character from the 1970s British TV series) would be proud. Labour started their decidedly socialist and popular political rhetoric during Ed Miliband’s election campaign. Rail fares and energy prices would be frozen, and, a possible scaling back on Great Birtain’s NATO commitments. Indicating that the political landscape is changing in the UK these manifesto pledges where offering voters something new. An oft used slogan which gained traction in the United States and was used in the title sequence of Citisen Smith, the 1970’s TV series. American teenagers would use the slogan as a form of rebellion against the older generation, especially the establishment. No surprise then that Jeremy Corbyn is campaigning heavily to the younger generation. A generation annoyed at poor job opportunities and even lower prospects of increasing pay. Pay increases sufficient enough to pay off their university debts. O Jeremy Corbyn was at Glastonbury of all places to rally Britain’s youth. Labour placards also regularly feature outside music festivals. The same slogan was came to fame in the 1960s as pro-democracy students used it to protest against the Vietnam War. A costly war that heralded a difference economic period in the USA. The counterculture at the time adopted John Lennon’s songs in the anti war movement (viz Power to the People 1971, written and performed by John Lennon). Jeremy Corbyn has upped the ante on socialist policies and is returning the Labour party to old Labour. Policies suggesting a revival in 1970s politics include. Bringing more NHS services under government control. Plans to pass more power to unions and impose price caps on firms doing work for the Government. Restrictions on calling strikes would be scrapped. A pledge for rent controls. Karl Marx eat your heart out. Mr Corbyn regards Karl Marx as a great economist, something he said on the Andrew Marr Show. Marx is one of the founding fathers of radical socialism. Full of ideologies that have never really worked in a real world environment, but, only in the Ivory Tower of philosophical thinking. Tereasa May’s feathers where severely ruffled during the last election where the conservative party lost it’s majority. May is now getting in on the act with planned price caps on energy companies and rail fares, although, they would be implemented in a much more market friendly way. Tereasa May dislikes the unacceptable face of capitalism and wants to hand more power to workers by tackling some of the inequalities in the system such as high executive pay. Weighing up Tereasa May and Jeremy Corbyns policies and policy pledges, Mr Corbyn is the politician most likely kick off a decade of 1970’s type politics. Our view, at LetsCompareBets.com, is that this is a genuinely well meaning, but probably caused by a misguided notion of National duty with a peppering of opportunism. So what was up with the 1970’s? A decade where the nation was in flux. It was a difficult time for young people who where hurt by the sharp end of a recession and unemployment. Stanley Kubrick directed A Clockwork Orange in 1971 (for a reason!). A period of economic stagnation that put an end to the general post World War economic boom. Known as a period of stagflation where people could not find jobs at a time when prices (of staples, food, energy and transport) where going sky high. People with jobs got large pay rises to keep pace with inflation which reinforced the problem of rising prices. Three day working week anyone? Trade Unions had more power than they do now. Due to the miners strike announced December 1973 a three day working week was imposed due to worries over power shortages. A large trade deficit was accompanied by inflation that peaked at 20% and quickly rising national debt. Strikes continued to bring the economy to it’s knees and unemployment quickly increased further. Heralding what is known as the Winter of Discontent. Westminster City Council had to use public parks to pile up all the waste that striking waste collectors had left sat outside peoples homes. It wasn’t just the streets filling with rubbish: Schools closed and the dead where left unburied. Essentially the Government was a massive employer through all the nationalised industries and was held over a barrel by the trade unions. The haves kept a low profile and the have nots got seriously pissed off. Generally speaking the end of 1970’s where a period of de -leveraging where the United Kingdom had to sort out it’s debts and feel some pain before the economic cycle climbed the other side of the hole it was in. Politics of this period undoubtedly made the process much worse than it needed to be. Inflation of 20% caused high interest rates in turn causing property prices to collapse which triggered a secondary banking crisis. The top 30 companies in the FTSE stock market saw share price declines of 73%. The stock market whipsawed back and forth for the rest of the decade. A sterling crisis was triggered because international markets didn’t want to see the foreign currency reserves destroyed by high inflation. What is proposed now that makes it all look like a return to the 1970’s? Free markets are supposed to look after themselves and there are periods of expansion and wealth creation, and periods of contraction. Government is kept at arms length but can use regulation, incentives and giveaways in order to manipulate the economy to benefit sections of society that need a break. Meddling with prices and controlling whole industries centrally (like Mr Corbyn has suggested) distorts the market and leads to more trouble down the road. Money isn’t allocated in the right way, for instance,cap prices and investment seizes up. When the price cap is removed prices jump much higher to offset the period of under investment. Services suffer. Think energy crises, transport system without the correct safety measures, a tax consuming monster of a public health service, and a shortage of rental property (because landlords are discouraged from investing in properties to let). More and more demands on taxes that just are not being collected due to unemployment, inflation and strikes. What is the difference now? Inflation is kept under control by our open borders (something we will lose to some extent with the current trajectory of Brexit talks), globalised supply chains, international finance, and technological progress. Brexit may be seized upon as an opportunity to ride the coat tails of a reinvigorated global economy by allowing the UK to cut trade deals with the rest of the World. We have not had an oil crisis, like there was in the 1970s. Fuel prices have dropped dramatically from the highs seen before the last economic crash, in turn taking many inflationary pressures out of the system. Food prices are nicely under control due to supermarket price wars and German discount retailers disrupting markets. Economists ,politicians and central bankers have more powers to engineer better economic outcomes than anyone in the 1970’s was ever able to do. Potential flies in the ointment include flash points that cause key players in the system to stop playing ball. These include trade wars primarily between the USA and China, further tension between the USA, Russia and China over the Korean peninsular. The global economy may not look nearly as welcoming if major trading partners are in the middle of major geopolitcal spats. Who’s going to win the next general election? Polls indicated a major Labour wipe out in the last election and the conservatives where on track to win a majority. A shock early election (pre Brexit) called by Tereasa May designed to strengthen her mandate for Brexit, had the opposite affect and severely weakened her position. A conservative majority was just a dream and the Brexit negotiations just got far more difficult. Now hard Brexit is firmly underway odds of a Labour victory next time round just got shorter. But seriously, who would want to go back to the 1970’s! People don’t have much power if they can’t get a job, worry that they’ll be able to keep the lights on, and have their rubbish is building up on the door step. Surely Mr Corbyn can not be rallying a section of society who stands to lose the most by his policies. Odds for who is going to be the next Prime Minister after the general elections show David Davis favourite at 5.8 with Jeremy Corbyn not fair behind at 6. I can see Mr Corbyn’s odds shortening as Brexit Negotiations progress, but, I would bet on Mr Corbyn becoming the next PM. There will be plenty of time before the next general election as the conservatives will want to kick that particular can down the road for as long as possible. Tereasa May isn’t currently in the running, but it may not be wise to write her off just yet. Our preferred bookmaker is Betfair where you can back or lay your opinion and cash out at any time. Visit Betfair to get the information. Interested in a different angel to take at playing the political upheaval? There are two companies who’s share prices have been negatively affected by recent political rhetoric. Buying shares off Royal Mail and SSE would be like taking a bet that Mr Corbyn would not win the next general election without that part where you would lose all your stake if he does win. Royal Mail are currently having problems with the workers union over pension entitlements, and SSE, the energy company, face prospect of energy price caps. Both pay high and sustainable dividends. With a conservative victory negative sentiment over political risk would be removed which could be positive for the share price. Not interest in Shocks and Scares? Then check out our Profit Accumulator review, another way to think outside of the box. Visit our Profit Accumulator review.